I recently downloaded the OSR Tools plugin for QGIS and added in an API key. 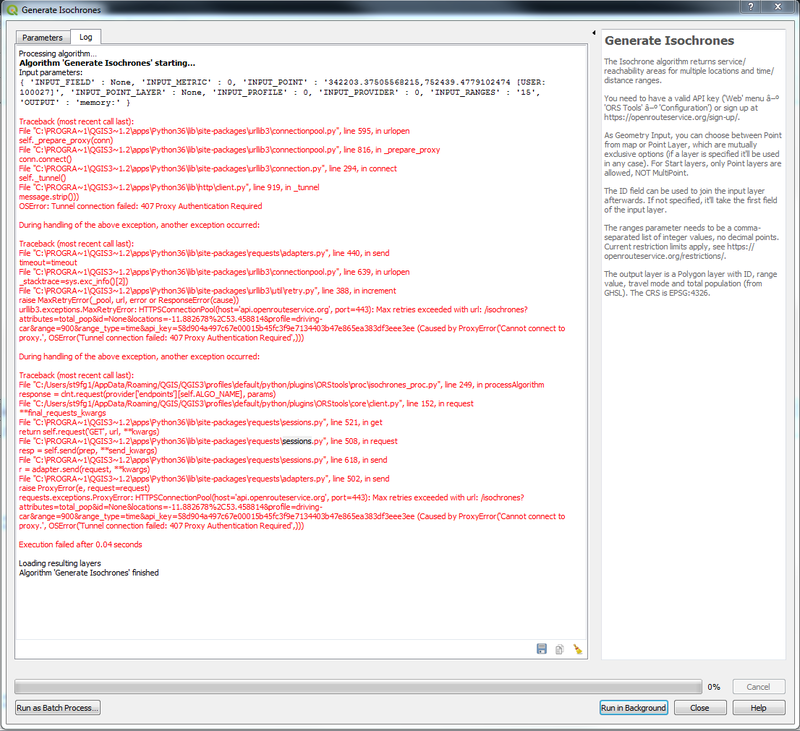 When I try to get ischrones for a layer within my project I get the following error. I am using this tool within work, could an internal firewall be the cause to the error? yes, that’s a Proxy issue. I don’t have the time these days to take a closer look. But I’ll have to fix soonish, several people reported this. If you take your laptop home or you connect to the internet via your phone hotsport, it’ll work. No worries…thanks for the feedback Nils! Cool, thx! ZIP files as attachments are fine for your IT though, right? Its a quicker process to get an email attachment approved than a download from the internet! Zipped files should be fine! A mail with subject "Proxy Test QGIS" from nils@openrouteservice.org to Finbar.Gillen@axaie365.axa365pr.com was quarantined as it may contravene AXA's company e-mail policy. If your e-mail is of valid business content the IT Department will release it automatically. Either get it from your IT admin or let me know in what way you’re able to exchange data. Try and send it to fgillen1@hotmail.co.uk. If I can’t download it from that then you will have to give m a download link and I will try and get IT to pass it. Is there any solution to this problem yet? Since I am also using ORS tools at work, I assume this problem also is caused by an internal firewall? Am I right? I just uploaded a new version to the repository, should be availbable within the day. I don’t know if it fixes things, since I don’t have a proxy available, but it should. Use QGIS QgsNetworkAccessManager to respect global Proxy settings and drop requests. Seems to be working for me…great job! It’s already in the plugin repo apparently. The batch isochrone function works fine for me. Wondering if anyone else is having issues with the ‘Generate Matrix’ function? I am using two sets of points, where the numbers are both below the restrictions set out in the documentation and both are the same projection. No rush on this being fixed… just highlighting potential issue. It’s fixed and already available in the plugin repo.